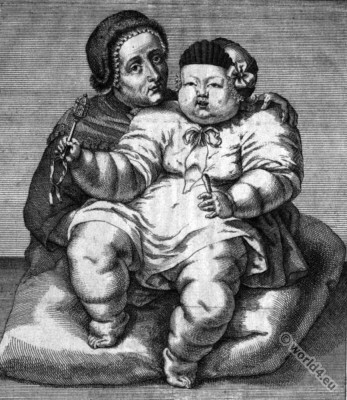 Home » German mother with monstrous child in 1761. Baroque era. The picture above is taken from an engraving from the 18th century. Therein, the child is referred to as divine miracle. His age is one year and eight days. According to the manuscript, he weighs a duck and seven pounds and was born in 1760 in Bavaria. His birthplace is Mimming in Hengersberg. His father is 45 and his mother 40 years old and their first child. By profession, they are farmers. The child has four teeth and has survived the chicken pox. The woman’s costume corresponds to the Bavarian baroque of that time.